US Marshals were the law of the Land, both feared and respected. This badge is an authentic replica, double-dye struck in solid 14 gauge copper, silver plated and finished by hand to an antiqued (tarnished) finish. So realistic you can hardly tell them from the real thing. All have original pin and holder soldered on the back the way they were in the old days. American quality you can see and feel. 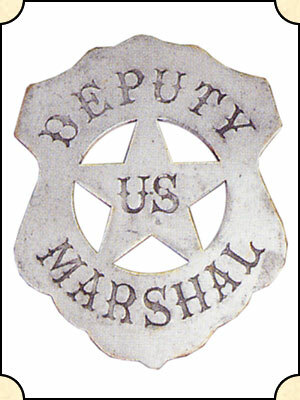 One of the least know, but most effective Deputy US Marshals, Bass Reeves, could have worn one of these badges. Reeves was know for venturing into Indian Territory, most times alone but also with an Indian Guide. Though he couldn't read, Reeves got his mark every time.